LeRouxIsPHat wrote: True...just like what happened with Beirne and Farrell, and you've been so forgiving of Leinster for that. 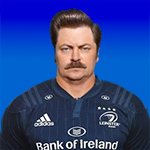 Beirne was given every chance at Leinster but couldn't stay fit long enough to play meaningful rugby. I think the point LRIP is making is that Mildly/Gorey has been critical of Leinster for not doing enough to keep Beirne/Farrell, yet in this instance seems happy to accept there's only so much coaches and Leinster can do and that the player has ultimate autonomy. johng wrote: Bleyendaal qualified last Jan but has been pretty much injured since. Ah, apologies, I should really find out what year this is! He was still brought into camp prior to his qualification though. Leinster didn't try to keep Beirne and Farrell when they left. They tried to keep McCarthy, but he chose to play for our biggest rivals instead. mildlyinterested wrote: Leinster didn't try to keep Beirne and Farrell when they left. They tried to keep McCarthy, but he chose to play for our biggest rivals instead. Well they did as much as they could with Beirne, and with both players there was no sign of their potential at the time. I guess it's another indication of your unwillingness to see situations in anything other than black and white though. There was nothing to stop Schmidt bringing Beirne into the 6N camp to "meet his team mates". But what was the point if there was no chance he would play? Addison came in oon the back of an injury to the centres. I've previously said the release of Beirne and Farrell was understandable, if regrettable, given their injury records and performances leading upto release. Yes there was, his employers, Scarlets. Dave Cahill wrote: I wonder if JGP will be getting a nice mid-winter sunshine break to meet new team-mates next week. I was thinking this too but the good news on Luke probably makes it less likely. Had Luke done his ACL I'd have been sure about it. Can't believe Tyler B has been in Ireland for so long, he must have been injured for close to half that time. There was and Joe said it himself. Not bringing him in cause Scarlets could just call him up in the break weeks. johng wrote: McCarthy signed for Saracens? Connacht would have been a better one. Dave Cahill wrote: Yes there was, his employers, Scarlets. And JGP would be released back to Leinster ebing surplus to requirements when they're fine tuning later in the week. JFP took a while to adjust, but he's excellent. He had to change his game. One interesting thing that happened at the weekend was he took a tap penalty and we scored. When he arrived he would have done that but we knocked that out of him. I think thats a sign of his rising confidence in our system (cynical me notes that McGrath and McCarthy are injured so his unstoppable right now). For a team that likes to play up tempo, Leinster are very risk averse when it comes to tap penalties. Yeah but Joe could have put him in the 27(it's 23+4) man squad for the game and kept him around if he really wanted to. It's messing and probably would've pissed off a few players but he could've done it. What sense would it make bringing a player he couldn't pick to Portugal? We're an injury away from needing Blade to bench and both lads in front of him are probably playing this weekend. Patterson and O'Sullivn need gametime to develop, shame that it will likely be limited from playing AIL over next few months. O'Sullivan just made his HC debut and has 7 caps this season (& isn't finished). ronk wrote: O'Sullivan just made his HC debut and has 7 caps this season (& isn't finished). for a total of 95 total senior minutes. he needs game time and he is missing out on getting a lot of it at AIL level, due to the injury situation in the senior team. Does that 95 minutes for Leinster outweigh whatever minutes he would have gotten with Clontarf in his long term development?